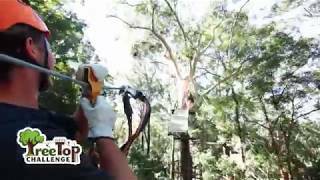 The TreeTop Challenge is an exciting aerial adventure located inside the Currumbin Wildlife Sanctuary where you will be experiencing up to 80 aerial challenges including 11 huge ziplines that are spread across five courses and suspended high above many animal enclosures! When you undertake their five unique courses, ranging from easy to extreme, you will be climbing through the trees high above many iconic Australian animals including dingoes and emus while zip-lining over crocodiles and kangaroos! The TreeTop Challenge is perfect for groups of all sizes, with no experience required. They recommend one to three hours with packages to suit all itineraries. So are you ready for a day of thrills, action and epic adventure as you experience the rush of flying through the trees, the satisfaction of conquering your fears and getting outside your comfort zone? Child $39 - $39 Children aged eight to 14. Indicative Prices $49 - $49 Adult price.